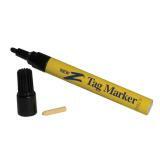 Does not write on: Swivel, Snapp, Qwik or Q-flex 1.0 tags. First off, it works. It does what it is supposed to do and the instructions are clear. On the negative side, I had a bear of a time getting the lid off. It didn't want to pull off. I tried unscrewing (don't) but that only unscrewed the tip part off. It also has a strong odor (that smells like it could kill brain cells), so use in a well ventilated area. 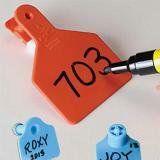 It is easy to get too much ink, but if you follow the instructions, you can have a nice, fairly permanent tag. Works great! I usually go over the numbers twice to prevent fading. It keeps a continuous flow of ink when writing.